Sure, she used it to make pickles. And they were darned good. Maybe she also used it to make butter and tortillas. So why didn’t she tell you that you could use it in your reef aquarium? Probably because you never asked. I’ll bet she knew you could, but just wanted you to discover it for yourself! This article describes everything you need to know about using limewater (aka kalkwasser) to maintain calcium, alkalinity, and pH in reef aquaria. Topics include what it is, how it supplies calcium and alkalinity, where to get it, how to use it, and what impurities it may contain. Much of the information has been collected from other articles and online sources, and links to these references are scattered throughout the article. They can be useful for those interested in further detail on a particular topic, or who want to see more of the reasoning behind a particular claim. What Gets Left Behind On The Bottom Of The Limewater Container? Both lime and quicklime are suitable for making limewater (kalkwasser) and otherwise supplementing calcium and alkalinity in reef aquaria. There are some important differences between the use of lime and quicklime that will be discussed in subsequent sections. These differences relate to the fact that quicklime is slightly more potent and gets hot when water is added to it (equation 2). A couple of other definitions are worth noting. Limewater is the solution that forms when lime (or quicklime) dissolves in fresh water. The solution is exactly the same using lime or quicklime, as long as the same amount of calcium is added. Kalkwasser is simply the German word for limewater. Neither term is ever correctly applied to a solid, so any solid material sold as “kalkwasser” is either lime or quicklime. Aquarists can buy lime from a variety of different aquarium supply companies. Most often, these companies sell calcium hydroxide and call it kalkwasser or kalkwasser mix. Some of these companies claim that their lime meets a particular standard for purity (Warner, ESV, and Seachem, for example), and these standards are detailed in later sections of this article. Others (Kent, Coralife and Two Little Fishies, for example) do not appear to make specific claims other than claiming that their products are pure. Pickling lime can often be found at large grocery stores, especially in the Fall. Apparently, some folks still do use it for canning, although one company (Ball) has apparently stopped selling it. However, you may still find their product occasionally. Another major brand is Mrs. Wages, which can also be obtained online for $1.85 per pound or less. Any brand of pickling lime is likely fine to use as a base for limewater solutions, as it has to be food grade to be sold commercially (the implications of which are described below). Many aquarists have recently turned to buying bulk brands of food grade lime or quicklime. Some primary manufacturers such as the Mississippi Lime Company sell a variety of different grades of lime and quicklime, including food grades of each. Unfortunately, they do not sell directly to the public, and even their distributors will sell only large amounts (many hundreds of pounds). Still, many reef clubs or local reef stores have organized purchases for their members or customers. There is no beating bulk lime for cost when compared to other balanced methods of supplying calcium and alkalinity to aquaria. I bought 100 pounds of quicklime this way several years ago for less than $0.50 per pound, and expect it to last a considerable time into the future. One should be careful using agricultural lime, such as the products sold by Home Depot or other home improvement stores. In many cases this material, despite being called lime, is actually calcium carbonate. If so, the term lime is simply short for limestone. Even when the bag gives concentrations of CaO and/or MgO, that statement is a unit of measure of calcium or magnesium, not an indication that there is really CaO in the bag. Limestone is not suitable for making limewater since it is insoluble. Further, in agricultural grades of calcium hydroxide or oxide, the purity may not be adequate for a reef aquarium. Lime is graded in a variety of ways. One way has to do with the amount of magnesium it contains. High calcium quicklime (and lime) is derived from limestone (calcium carbonate) containing 0-5% magnesium carbonate. Magnesian quicklime (and lime) is derived from limestone containing 5% -35% magnesium. Dolomitic quicklime (and lime) is derived from limestone containing 35% - 46% magnesium carbonate. Most reef aquarists use high calcium limes since the magnesium is not generally soluble in limewater (a fact discussed in detail below). Another way of grading lime has to do with impurities present in the lime. Manufacturers may refer to grades in a wide variety of ways, and some of those that are worth knowing are detailed below, along with four brands that claim to meet these specifications (Warner, ESV, Seachem, and Mrs. Wages). Other companies that sell to aquarists (Kent, Coralife, and Two Little Fishies, for example) do not specify the grades used (at least that I can determine). If you use those brands, then you are relying on the manufacturer’s claims to ensure suitable purity. 1. . FCC, which stands for Food Commercial Codex. It states that the lime or quicklime is food grade, and meets minimum standards to be a food product. In that sense, FCC has purity assurances that other industrial and agricultural grades may not have. The impurities regulated and the actual impurity levels in typical batches from the Mississippi Lime Company are shown in Tables 1A, 1B, and 1C. The requirements for Ca(OH)2 are slightly more stringent than for CaO, but Ca(OH)2 is slightly less potent so an aquarist would need to use more. Any food grade lime, or pickling lime (such as Mrs. Wages or Ball’s) should meet the specifications in Tables 1A and 1B. As seen in Table 2, the actual impurity levels in commercial FCC products can be much lower than the FCC limits. Seachem also claims to meet this specification. 2. USP stands for United States Pharmacopoeia and NF stands for National Formulary. USP/NF calcium hydroxide can have the impurities shown in Table 2. This rating is similar to, but requires slightly fewer tests than does the food grade rating. Seachem claims to meet this specification. 3. AR (ACS) stands for Analytical Reagent grade, as described by the American Chemical Society. Reagent grade calcium hydroxide can have the impurities shown in Table 3. The Reagent grading is focused on attributes that are important to chemists, but that may not matter much to reef aquarists, such as low magnesium, sodium, and potassium. It also does not focus on toxic impurities (no testing for arsenic or lead, for example). The total amount of heavy metals allowed is similar to food and pharmaceutical grades. Warner claims to meet this specification. 4. Water Chemicals Codex is a grade that is described by the Committee on Water Treatment Chemicals of the National Research Council. The grade is specifically listed as suitable for treating potable (drinking) water. Consequently, it focuses on toxic impurities, as shown in Table 4. The specification is the same for calcium oxide and calcium hydroxide. ESV claims to meet this specification. Aquarists have used limewater very successfully for a number of years, and it is the system that I use in my aquarium. It is comprised of an aqueous solution of calcium and hydroxide ions that can be made by dissolving either quicklime or lime in fresh water. Note that the water must be freshwater. Combining lime with seawater will result in a mess of precipitated magnesium and calcium carbonates and hydroxides. The only inherent difference between calcium oxide and calcium hydroxide is that adding a molecule of water to quicklime produces lime, and that a great quantity of heat can be generated when that happens. Consequently, dissolving quicklime can make water quite warm, especially if an excess of solids is added. Some aquarists have damaged equipment by adding a large amount of quicklime to a small amount of water in a plastic reactor. The heat released can easily boil the water, and some plastic devices may not be able to withstand that hot, corrosive mixture. In an aquarium with an acceptable pH, there is no concern that the alkalinity provided by limewater is any different from any other carbonate alkalinity supplement. The hydroxide immediately disappears into the bicarbonate/carbonate system. In other words, the amount of hydroxide present in aquarium water is really a function of only pH (regardless of what has been added), and at any pH below 9, it is an insignificant factor in alkalinity tests (much less than 0.1 meq/L). Consequently, the fact that alkalinity is initially supplied as hydroxide is not to be viewed as problematic, except as it impacts pH (see below). Limewater that is saturated with calcium hydroxide has a pH of 12.54 at 25ºC. It is actually recognized as a secondary pH standard. The pH is substantially higher at lower temperature (12.627 at 20ºC and 13.00 at 10ºC), and lower at higher temperature (12.289 at 30ºC; 11.984 at 40ºC). Saturated limewater has a conductivity of about 10.3 mS/cm at 25ºC, and contains about 808 ppm of calcium and 40.8 meq/l of alkalinity. Slightly more calcium and alkalinity dissolve at lower temperatures, and less at higher temperatures. Of interest to chemists, a large fraction of the calcium in saturated limewater is present as the ion CaOH+, with the remainder being Ca++. The CaOH+ will instantly dissociate into Ca++ and OH- upon its addition to aquarium water. The fact that limewater is very basic (the pH is typically above 12) demands that the limewater be added slowly to an aquarium unless very small additions are made. The reason for this is two-fold: to prevent the local pH in the area of the addition from rising too high (slow addition permits more rapid mixing with tank water to reduce the pH), and to prevent the overall tank pH from rising too high (slow addition allows the tank to pull in CO2 from the atmosphere during the slow addition, mitigating the pH rise). Some aquarists advocate rapid addition, and that is fine for small additions that would add less than 0.2 meq/L of alkalinity to the aquarium, but larger additions will drive the pH too high, as detailed below. Consequently, limewater is most often added slowly, by dripping or slow pumping. Often it is added as the top off water, replacing most or all of the evaporated water. Such pumps add cost and complexity to the system, especially if combined with a float valve or switch (I use the latter and a Reef Filler pump that I bought from Champion Lighting). 1. Slow dosing clear, settled limewater to replace evaporated water. This can be attained with drippers (homemade or commercial) or slow pumps (including diaphragm pumps like the Reef Filler or peristaltic pumps like the Litermeter). The delivery can be controlled by float switches or valves, or matched to the evaporation rate by controlling pump speeds. Using pumps and float switches raises the costs considerably, but also reduces the time spent dealing with limewater. I spend only five minutes once every three weeks to replenish my limewater delivery system. Sophisticated float switches and slow pumps also lessen the likelihood of overdosing that can come with other methods. Some aquarists have tried to use powerheads as part of such a limewater delivery system. Frequently, these add too much limewater at once before a float switch turns them back off. Aquarists designing such systems should keep in mind the dosage limitations described below. 2. Dosing milky limewater, to get more lime into the aquarium than is available in clear, settled limewater. A drawback is the delivery of impurities in or on the solid particles, and the possibility that some solids may interact with organisms before they dissolve. 3. Dosing limewater mixed with vinegar. The vinegar allows more solid lime to dissolve into the limewater, and limits the maximum pH that the aquarium will attain. Drawbacks include the possibility that bacterial growth will be driven by the acetate in the vinegar; the fact that some of the measured alkalinity may be acetate, which is not used by corals and coralline algae to calcify as far as I know; and that some impurities in the lime may dissolve in the presence of vinegar when they might settle out in its absence. Details behind the use of vinegar are given below. Limewater containing typical amounts of vinegar is still very high in pH and must be dosed slowly. Much of the vinegar’s pH reduction comes after it is metabolized by bacteria, as is shown later in this article. 4. Delivering a small amount of limewater all at once. Adding 1.25% of the aquarium’s volume (1.25 gallons of limewater per 100 gallons of aquarium water) as saturated limewater all at once raises the pH by 0.6 to 0.7 pH units. Such an increase is clearly too large. Adding a smaller portion all at once can, however, be acceptable. Adding, for example, 0.25% of the aquarium volume (0.25 gallons or 1 L of limewater per 100 gallons of aquarium water) will raise the pH by only 0.1 to 0.2 pH units. Unless the pH is high (>8.4) before the addition, that amount is likely acceptable. The other concern with all-at-once dosing is that the local pH in the area of the addition will rise considerably higher than the values above. So dosing must be done far from living organisms, and in high flow areas that will facilitate fast mixture. In some aquaria, such restrictions make all-at-once dosing of limewater prohibitively risky to living organisms. 5. Delivering a small amount of solid lime slurried (dispersed) in a small amount of water. Adding one level teaspoon of solid lime (Ca(OH)2) slurried in a cup of water to 40 gallons of aquarium water all at once raises the pH by 0.6 to 0.7 pH units. That is clearly too much. Adding a smaller portion all at once can, however, be acceptable. Adding, for example, 1/4 teaspoon to 40 gallons will raise the pH by only 0.1 to 0.2 pH units. Unless the pH is high (>8.4) before the addition, that amount is likely acceptable. The other concern with all at once dosing is that the local pH in the area of the addition will rise considerably higher than the values above. Moreover, dosing a slurry raises the added concern that the solids must dissolve before encountering organisms that may take them up and be harmed. So it is best to dose such materials to a sump, and watch that they completely dissolve before reaching the main aquarium or a refugium. In many aquaria, such restrictions make all–at-once dosing of a slurry prohibitively risky to living organisms. 6. Delivering limewater via a reactor, sometimes called a Nilsen reactor (picture right). In this setup, fresh water is added to a small chamber containing solid calcium hydroxide. After mixing with the lime and becoming “limewater,” the fluid portion then continues on to the aquarium. The mixing is often performed by a magnetic stirrer, with a magnet inside the chamber driven by a rotating magnet outside. These systems normally mix the lime and fresh water several times per day, but not continually. It can be difficult to get such systems to continually deliver saturated limewater, and it is technically challenging to use vinegar with them. They are, however, well suited to use under aquaria or otherwise where space is limiting. The reason that limewater raises the pH of aquarium water so considerably is because of the hydroxide that it adds. As described above, the hydroxide can combine with carbon dioxide to form bicarbonate and bring the pH back down. In many aquaria, however, the aeration is not great enough to bring in carbon dioxide fast enough to meet all this demand, and the pH rises. There are several ways to add additional carbon dioxide to meet this demand, including delivery from a carbon dioxide cylinder. Many aquarists, however, choose to add carbon dioxide in the form of vinegar. Many of them choose to add the vinegar directly to the limewater, although if pH reduction is the goal, it can also be added directly to a high flow area of the aquarium. One of the potential side effects of this metabolism is that the bacteria performing the transformation may grow faster because of it. This growth may have positive or negative outcomes. One potentially positive outcome is that as they grow, they will necessarily consume nitrogen and phosphorus, possibly lowering nitrate and phosphate levels in the aquarium. Another is that the bacteria may be a suitable food source for other organisms. Potential drawbacks can include reduced oxygen as the bacteria use it to consume the acetate, and the appearance of unattractive bacterial mats in the aquarium (reported by some, but not by the majority of vinegar users). where [Ca++] is the concentration of calcium (in moles/L) and [OH-] is the concentration of hydroxide (in moles/L). Consequently, if you reduce the concentration of OH- via equations (10) and (11), then more Ca(OH)2 can dissolve into solution and still meet the equation (13) requirement. Consequently, additional solid lime can be dissolved into limewater using vinegar. How much can be used? The more vinegar that is used, the lower the pH of both the limewater and the aquarium will be. One reasonable point to shoot for is to add about the same amount of total CO2 via the vinegar as is needed by the lime to form HCO3-. This balance is roughly matched by using three level teaspoons of solid lime per gallon of limewater, and 45 ml of vinegar per gallon of limewater. For those aquarists choosing to use vinegar in limewater, these values are a suitable starting point. Note that the pH of the limewater is still quite high, so slow dosing is usually required. What kind of vinegar should be used? Luckily, cheap distilled white vinegar is likely the best. More expensive flavored and colored vinegars, such as red wine vinegar, will deliver other unnecessary organic molecules to the aquarium, and are best avoided. One interesting aspect of limewater is its ability to self purify before being added to the aquarium. This happens in several ways, but all relate to the fact that most aquarists dissolve it and then let any undissolved solids settle out. Few, if any, of these solids are then dosed to the aquarium. It turns out that these solids can contain many of the impurities that came to the limewater, either in the solid lime, or in the water itself. In a recent article I showed experimentally and theoretically how this process works for a variety of metals, including copper, nickel, and cadmium. Figures 1 and 2 show experimentally what happens when solid lime is added to water that contains a significant amount of copper. In the high pH of limewater, copper precipitates from solution as copper hydroxide. It also turns out that excess lime solids themselves can help remove additional metals from solution, as those metals bind to the surfaces of the undissolved lime. Besides metals, other impurities can also be precipitated from limewater as calcium salts, including phosphate. Figure 1. 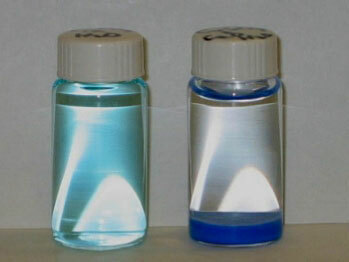 Fresh water containing copper, giving it a slight blue color (left). Figure 2. 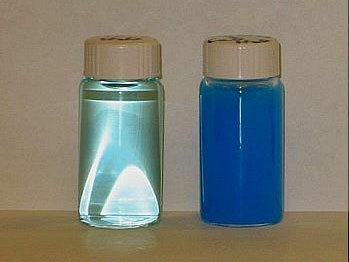 Fresh water containing copper, giving it a slight blue color (left). of the visible blue color has settled out of solution. This purification is also seen in practice by many aquarists who have noticed the solids on the bottom of their limewater containers discolor, often to a bluish/green color suggesting copper. For these reasons, I recommend that lime solids not be dosed to aquaria when it is possible to avoid it. Letting the limewater settle for a few hours to overnight will permit most of the large particles to settle out, and whether it looks clear at that point or not, it is likely fine to use. In general, it is a good practice to leave residual solids on the bottom of limewater reservoirs rather than cleaning them out every time, as they may actually help purify the water by these precipitation mechanisms. Once the solids discolor, or have been collecting for 6-12 months, however, they should be discarded. As discussed above, solid lime can contain considerable material in addition to calcium and hydroxide. In particular, most grades allow a significant amount of magnesium and alkali salts (which include sodium, potassium, and lithium). Of these, many aquarists would be most concerned with magnesium. In order to better assess how much strontium and magnesium would be delivered by the use of lime, I determined how much calcium, magnesium, and strontium were present in the solid quicklime that I use. Details of the testing method were presented in a previous article. The results are shown in Table 5. Table 5. Alkaline earth metals in quicklime. As expected, the primary ingredient is calcium. Magnesium is fairly low, and strontium is quite low. This material has a Mg/Ca ratio of 0.0038. That is at the low end of the Mg/Ca ratio found in corals, and well below that found in coralline algae. It has a Sr/Ca ratio of 0.00037. That Sr/Ca value is far below the 0.02 ratio of Sr/Ca found in typical corals. I dose my aquarium with limewater made from this quicklime. I typically use limewater at less than saturation because my reef aquarium does not need full strength limewater. In order to test for magnesium and strontium in the limewater that I dose, I made 44 gallons of limewater, and dosed it for about three weeks. I then took a sample of the clear limewater that remained. It had a conductivity of 7 mS/cm, indicating that it is not saturated (saturated limewater usually has a conductivity of about 10.3 mS/cm). This limewater sample was analyzed (the details of which were presented in a previous article) and the results are shown in Table 6. Table 6. Alkaline earth metals in limewater. It is interesting to note that relative to calcium, magnesium is greatly underrepresented compared to that in the starting quicklime. The reason for this result is the well-known insolubility of magnesium hydroxide at high pH. Any magnesium ions released into the solution rapidly combine with hydroxide to form insoluble magnesium hydroxide that precipitates. In a previous article on the solubility of metals in limewater, I showed a graph of the theoretical solubility of magnesium as a function of pH. At the pH of limewater (low 12’s) the solubility is between 0.01 and 0.001 ppm. The experimental solubility here is a tad higher (0.017 ppm), presumably for one of two reasons: some particulates of magnesium hydroxide may have been present in the solution which were detected as soluble magnesium when in fact, they were not. A second possibility is that the solution simply had not reached thermodynamic equilibrium, and the theoretical limit of solubility had not yet been reached. Nevertheless, the point is that it is expected that magnesium hydroxide will precipitate from such a solution, and this did, in fact, happen. The magnesium in solution was depleted by a factor of more than a hundred compared to what would have been in solution had it all been soluble. Relative to calcium, strontium was nearly unchanged in the limewater compared to the solid quicklime. The reason for the slight elevation is that strontium is even less likely than calcium to precipitate onto the bottom of the limewater reservoir, and so stays more in solution than calcium. In order to determine what was in it, I tested a sample of the white solid material that had been collecting for months on the bottom of my limewater reservoir, and detailed the results in a previous article. The white sludge was removed along with some limewater. The mixture of solid and liquid was acidified to dissolve it, and it was tested for calcium, magnesium, and strontium. The results are shown in Table 7. Only relative concentrations are shown as no effort was made to dry the sample prior to analysis, making absolute concentrations meaningless. Table 7. Alkaline earth metals in limewater sludge. As anticipated, relative to calcium, magnesium is enriched by a factor of 13 in the sludge compared to the solid starting quicklime. This magnesium may be present as both magnesium hydroxide and magnesium carbonate, but because magnesium carbonate is fairly soluble compared to calcium carbonate, it is most likely that the primary magnesium salt is magnesium hydroxide. It may also be mixed calcium and magnesium carbonates. Interestingly, strontium is actually depleted by a factor of two relative to solid starting quicklime, indicating that it is less likely than calcium to end up on the bottom of the reservoir. While strontium carbonate is somewhat less soluble than calcium carbonate, the strontium concentration in the limewater is so low that SrCO3 may not actually be saturated, so it precipitates less. The strontium that is there may simply be copreciptiated with calcium carbonate. The result of this reaction is visually obvious. The calcium carbonate can be seen as a solid crust on the surface of limewater that has been exposed to the air for a day or two (do not bother to remove this crust, it may actually be protecting the underlying limewater from further penetration by carbon dioxide). The formed solids also settle to the bottom of the container (as described above). Since solid calcium carbonate is not an especially useful supplement of calcium or alkalinity, this reaction has the effect of reducing the limewater’s potency. With sufficient exposure to air, such as by aeration or vigorous agitation, this reaction can be driven to near completion, with little calcium or hydroxide remaining in solution. This reaction is the basis of the claims by many aquarists that limewater must be protected from the air. It is also the basis of the claim that Nilsen reactors are to be preferred over delivery from still reservoirs of limewater. Neither of these claims, however, stands up to experimental scrutiny, as I showed in a previous article. Conductivity is perhaps the easiest way to monitor the potency of limewater, with a conductivity of about 10.3 mS/cm detected in saturated solutions at 25ºC. Figure 3 shows the potency over time of limewater in an aerated 1-gallon container. Clearly, the potency drops rapidly due to the formation of nonconductive calcium carbonate precipitate. container with an airstone (black). In a still reservoir that is not aerated, however, the potency is stable for a period adequate to permit dosing. Figures 3 and 4 show the conductivity of the limewater in my 44-gallon limewater reservoir over a three-week period. It was simply covered with a loose fitting plastic lid. It is apparent from the conductivity that the potency does not decrease significantly over time. standard44-gallon limewater reservoir with its lid on. For those interested in dosing saturated limewater, Figure 5 shows the potency of limewater in a still but uncovered 1-gallon container with excess solid lime on the bottom. In that configuration, any calcium and hydroxide that is taken away via precipitation to form calcium carbonate is apparently replaced by dissolution of more solid lime from the bottom. Consequently, even a simple unstirred one-gallon container can be used without fear of loss of potency, if there is solid lime on the bottom. container of limewater with excess solid lime on the bottom. Limewater can lose potency by reacting with carbon dioxide in the air, forming insoluble calcium carbonate. Since calcium carbonate is not an effective supplement of calcium and alkalinity in reef aquaria, the limewater can become less useful through this process. The rate at which this happens in large containers, such as plastic trash cans with loose fitting lids, however, is much less than many aquarists expect. There is, in fact, little degradation under typical use conditions. Consequently, the dosing of limewater from such large, still reservoirs can be just as effective as, or more so than, dosing using any other scheme. Since limewater has a pH above 12 (even when a reasonable amount of vinegar is added), it causes a substantial rise in pH when added to a reef aquarium. This attribute has both positive and negative aspects. It limits the speed at which limewater can be added without raising the tank’s pH too much (discussed above). It also can be a serious problem in accidental overdosing, where the pH can rise very high. Often, this overdosing can lead to the aquarium turning white like milk as calcium carbonate precipitates throughout the water column. 1. If the pH is 8.5 or lower (as it often is since a precipitation event itself reduces pH even if it was much higher to start with), there is little that can or needs to be done. Just wait a few days for the white calcium carbonate to slowly disappear. A water change is not necessary, although once the water is clear, testing calcium and especially alkalinity is in order (don’t bother to test the cloudy water as it will give false high readings as these tests detect solids even though they are not truly in solution). Few aquarists suffer the loss of organisms from such events. I’ve had several such events without any apparent losses. 2. If the pH is above 8.5, some action to reduce the pH is warranted. The higher it is, the faster and greater the needed action. Since such events may happen when few tools are available to solve them (e.g., New Year's morning when few stores are open), I’ll provide a number of options, although some are better than others. In all cases, reduce the pH only to 8.5 to avoid overshooting. The best option is to add carbon dioxide, either by bubbling the gas directly, or by adding soda water/seltzer (or blowing into a skimmer inlet if it is your only option). At least in the normal aquarium pH range, a teaspoon of soda water per gallon of tank water will lower pH by a couple of tenths of a pH unit. Overshooting with carbon dioxide, while undesirable, is less of a concern than is overshooting with any other option. A second option is to add vinegar. Be especially careful to not overshoot pH 8.5 or so, because when bacteria begin to metabolize the acetate, the resulting CO2 will further lower the pH, and oxygen will be consumed (equation (14)). For this reason, it is especially important to maintain aeration when using vinegar in such a fashion. I’ve added vinegar to my aquarium in similar situations without difficulty, although the pH was only marginally high and I did not need to add much. A third rung of options involves adding a mineral acid such as muriatic acid (HCl or hydrochloric acid) or sulfuric acid. I’ve added HCl to my aquarium in similar situations without difficulty. When performing such a mineral acid treatment, be very careful not to overshoot, and to monitor the pH during any acid additions. I would intervene in this fashion only if I could monitor the pH in real time, and could add the acid to a high flow area far from any organism. Diluting the acid in water (say, 20:1 or 100:1) prior to adding it to the tank is highly recommended for the safety of both the aquarist and the tank’s inhabitants (diluting vinegar, which is already dilute, isn’t necessary). One other drawback to adding a mineral acid is that it reduces the alkalinity. In such a case, the result may be elevated calcium and reduced alkalinity that will require significant correction. In a great many cases, reef aquaria have pH values lower than aquarists might prefer. This low pH comes about from excess carbon dioxide in the water, often either from a CaCO3/CO2 reactor, or from excess carbon dioxide in the home air. In both of these cases, limewater is arguably the best way to raise pH, and I have recommended it for this purpose in previous articles. 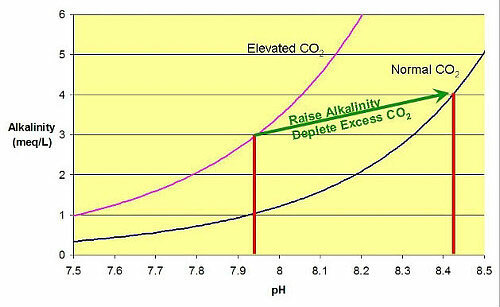 Figure 6 shows how adding limewater can raise the pH by taking up excess carbon dioxide and adding alkalinity, all without raising alkalinity relative to calcium (since it also adds calcium). and carbonate) and increasing the alkalinity. Despite old beliefs that using of limewater depletes magnesium, the truth is somewhat more complicated. As was shown above, magnesium is not dosed in typical settled limewater because it is insoluble; nor is it present in very high concentration even in undissolved lime. Craig Bingman showed that precipitation of magnesium carbonate and hydroxide in aquaria using limewater was unlikely to be significant. More likely, such depletion is simply the result of not delivering as much magnesium to the aquarium as is being “exported” during calcification. In a previous article I used the data presented earlier in this article to develop models of how magnesium might be depleted from reef aquaria over the course of a year using limewater based on magnesium incorporation rates typical of corals and coralline algae. Table 8 shows some of the data generated. Table 8. Magnesium depletion with dosing of settled limewater. As expected, the magnesium depletion is significant. While this depletion may be mitigated in a number of ways (including water changes), it shows that aquarists using limewater should consider monitoring magnesium over long periods of time. The previous article also compared magnesium depletion via limewater to magnesium depletion using a variety of different calcium carbonate materials in CaCO3/CO2 reactors. Using limewater can also deplete strontium, not because it is insoluble in limewater, but because there isn’t much in at least some brands of lime. Since strontium may or may not be beneficial, this may or may not be a concern. Many reefkeepers accept the concept that adding limewater reduces phosphate levels. This may be true, but the mechanism remains to be demonstrated. Craig Bingman has done a variety of experiments related to this hypothesis, and has published them in the old Aquarium Frontiers. While many aquarists may not care what the mechanism is, knowing it would help to understand the limits of this method, and how it might best be employed. Habib Sekha (Salifert) has pointed out that limewater additions may lead to substantial precipitation of calcium carbonate in reef aquaria. This idea makes perfect sense. After all, it is certainly not the case that large numbers of reef aquaria will exactly balance calcification needs by replacing all evaporated water with saturated limewater. And yet, many find that calcium and alkalinity levels are stable over long time periods with just that scenario. One way that can be true is if the excess calcium and alkalinity that such additions typically dump into the aquarium are subsequently removed by precipitation of calcium carbonate (such as on heaters, pumps, sand, live rock, etc.). It is this ongoing precipitation of calcium carbonate, then, that may reduce the phosphate levels: phosphate binds to these growing surfaces, and becomes part of the solid precipitate. The absorption of phosphate from seawater onto aragonite is pH dependent, with the binding maximized at around pH 8.4 and with less binding at lower and higher pH values. If the calcium carbonate crystal is static (not growing), then this process is reversible, and the aragonite can act as a reservoir for phosphate. This reservoir can inhibit the complete removal of excess phosphate from a reef aquarium that has experienced very high phosphate levels, and may permit algae to continue to thrive despite having cut off all external phosphate sources. In such extreme cases, removal of the substrate may even be required. If the calcium carbonate deposits are growing, then phosphate may get buried in the growing crystal, which can act as a sink for phosphate, at least until that CaCO3 somehow dissolves. Additionally, if these crystals are in the water column (e.g., if they form at the local area where limewater hits the tank water), then they may become coated with organics and be skimmed out of the aquarium. An alternative mechanism for phosphate reduction via limewater may simply be the precipitation of calcium phosphate, Ca3(PO4)2. The water in many reef aquaria will be supersaturated with this material, as the equilibrium saturation concentration in normal seawater is only 0.002 ppm phosphate. The supersaturation of calcium phosphate will be even higher in the high pH/high calcium fluid present where limewater enters reef aquaria. The locally high pH converts much of the HPO4-- to PO4---, and it is the concentration of PO4--- that ultimately determines supersaturation. That high supersaturation may tip the balance to precipitation of calcium phosphate, just as too much limewater all at once can tip the balance to precipitation of calcium carbonate. As with CaCO3, the precipitation of Ca3(PO4)2 in seawater may be limited more by kinetic factors than by equilibrium factors, so it is impossible to say how much might precipitate under reef tank conditions (without, of course, somehow determining it experimentally). As with the precipitation of CaCO3 containing some phosphate, if these calcium phosphate crystals are in the water column (e.g., if they form at the local area where limewater hits the tank water), then they may become coated with organics and be skimmed out of the aquarium. Another important consideration for limewater is the upper limit of the amount that can be added to an aquarium. This limitation exists simply because both the amount of water that can be added to an aquarium each day (to replace evaporation), and the amount of solid lime that can be dissolved in that water, are finite. Using lime slurries eliminates this concern, but brings its own issues that were discussed above. If an aquarium’s calcium and alkalinity demands are near the high end, then replacing all of the evaporated water with saturated limewater may not be adequate. In the case of my reef aquarium system, however, it is more than adequate. I do not even use saturated limewater (typically, I aim for a conductivity of about 7 mS/cm), and I still meet my aquarium’s demand. However, many aquaria have higher, maybe even much higher, demands for calcium and alkalinity than mine does. One way to enlarge the limewater’s impact is to add fans to the aquarium to increase evaporation. A second involves adding vinegar as described above. Many aquarists have successfully employed both of these methods. Additionally, aquarists often use a small amount of one of the other balanced additive systems (especially the two-part additive systems) to give a little boost to aquaria that need a small amount of extra calcium and alkalinity beyond what limewater can supply, without incurring significant capital costs. Likewise, these two-part additive systems can be successfully combined with limewater during periods of low evaporation when limewater may be temporarily limited and not meet demand (as during rainy cool weather). Aquarists frequently ask if they can mix other additives into their limewater. For some additives, the answer is clearly no. These include magnesium (which precipitates as magnesium hydroxide), calcium (which limits the dissolution of calcium hydroxide), and alkalinity supplements (which will precipitate as calcium carbonate). Strontium supplements can be combined with limewater, although there may be no real need for it. Silicate also can likely be dosed in this manner. Even though I use limewater and silicate supplements, I do not combine them. Other additives fall into a grey area, where they may or may not be damaged by combination with limewater. These include iodine and iron supplements, some forms of which may not permit mixing without causing problems, and I would not recommend doing so. On the negative side, limewater does have some safety concerns that don’t apply to most other calcium and alkalinity additive systems. The high pH of the liquid and the dust hazard of the solid are not to be treated lightly. Inhalation of the dust is to be avoided. Splashing limewater onto skin is also to be avoided, and should be followed by extensive rinsing with tap water if it happens. Splashing limewater into the eyes is especially to be avoided, and the use of safety goggles is prudent when using large amounts or in situations where exposure is likely. Extensive and immediate rinsing with tap water, followed by professional help, would be advised in the case of eye exposure. Keep in mind that the slippery feeling that a high pH liquid such as limewater causes on your hands is due to the breakdown of the fats in the skin into fatty acids (which are soaps). Quicklime has some special hazards beyond normal lime and limewater. Specifically, these relate to the heat produced when calcium oxide hydrates to form calcium hydroxide. A small amount of water added to a significant amount of quicklime will get very hot. It can even boil. Some aquarists have melted Nilsen reactors this way, and some have had such reactors “explode,” presumably through rapid heating and pressure buildup. So when using calcium oxide, be sure to add a small amount of lime to a significantly larger amount of water. Limewater is one of the most useful solutions for aquarists looking to maintain calcium and alkalinity in reef aquaria. I have used it for many years to supply my reef aquarium system. It can be inexpensive, is not too difficult to use, and can maintain the pH of reef aquaria even when it is otherwise reduced by calcium carbonate/carbon dioxide reactors or excess carbon dioxide in home air. Limewater does, however, have a number of eccentricities that aquarists need to be aware of when using it. These include high pH, limitations on how much can be added based on evaporation rates, and considerations of what else is or is not dosed along with it (such as magnesium). Hopefully, this article will provide aquarists with the information they need to effectively use limewater for their aquaria. 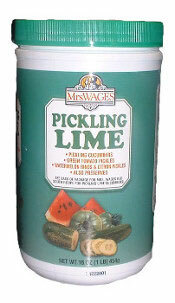 Oh, and the next time you see your grandmother, you might mention what a cool use you have found for pickling lime!